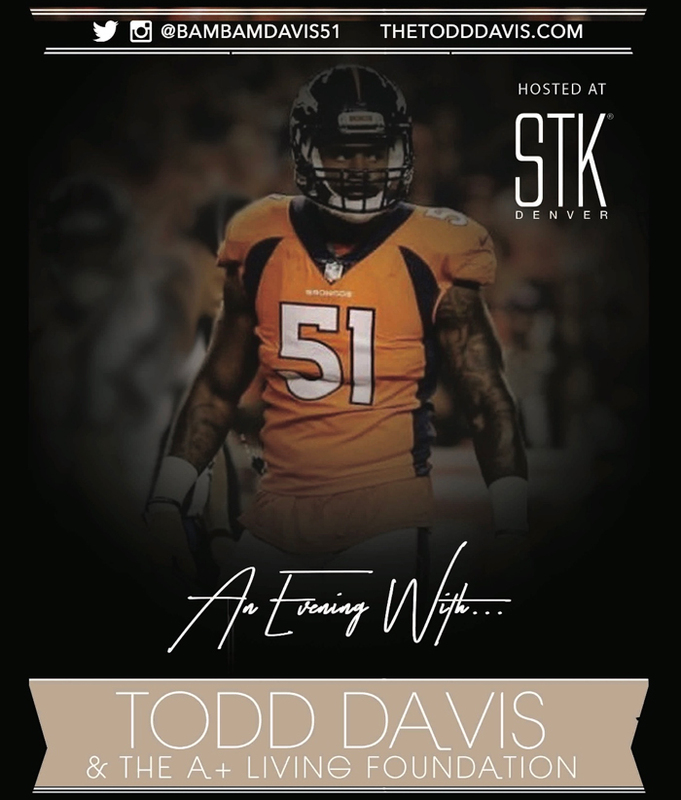 Please join Denver Bronco, Todd Davis and the A+ Living Foundation, as they host a private night at STK Denver on Monday, November 26th from 6-9pm. Your admission will allow you to learn more about the A+ Living Foundation, enjoy the amazing eats & drinks STK has to offer, along with being able to mix and mingle with Todd, his teammates, and more 'Who's Who' in Denver, Colorado. Your presence and willingness to be involved is greatly appreciated. The A+ Living Foundation relies heavily on the community support, to be able to carry out their fulfilling mission. A+ Living is a 501c3 nonprofit organization established by NFL Player Todd Davis and his family. Focused on empowering tomorrow’s leaders, A+ Living encourages adolescents to get A.A.M.P’d (Academics, Athletics, Motivation and Social Participation) by providing programs and events that enhance leadership skills. The A+ Living Foundation's mission is to inspire and encourage adolescents to become leaders in their homes, schools, and communities.